Tips, tricks, and test-kitchen secrets for the ultimate pie crust. We all aspire to the perfect pie crust: wonderfully flaky, tender, and baked to a beautiful golden brown, both top and bottom. That said, making pie crust is an acquired skill. It helps to understand the proportion of flour to fat to liquid in the crust; and the ideal technique for combining those ingredients. Want to learn to make the best pie crust ever? We can help. Already mastered pie crust? Continue to our pie baking guide. 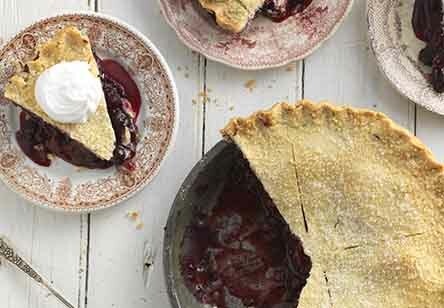 There's no doubt about it: crust can make or break a pie. Even the most enticing filling can't make up for crust that's soggy or tough. It's important to start with a crust recipe you trust. Here are the basics, offering you choices ranging from classic to gluten-free, as well as a couple of techniques. 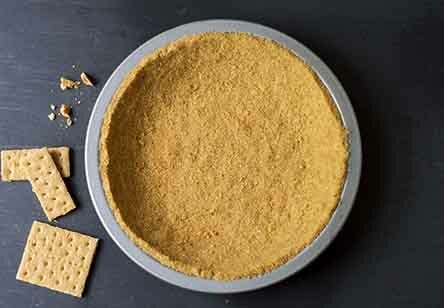 Can you mix different flours to come up with your own favorite pie crust blend? Sure. Try half whole wheat, half pastry or all-purpose. Or half all-purpose, half pastry. Each blend will create dough that behaves a little bit differently, requires a bit more or less water, and yields a slightly different crust. Experiment until you find your favorite combination. 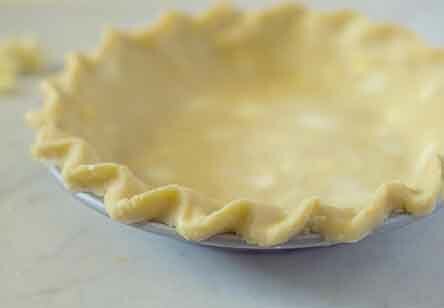 The simplest pie crust includes just four ingredients: flour, salt, fat, and ice water. Each needs to work seamlessly with the rest to produce a top-notch crust. Let's look at these key ingredients. You can make pie crust with several types of flour. That said, the lower the flour's protein level, the more tender the crust. Pastry flour (8.0% protein) will yield a delightful fork-tender crust, though its dough is a bit delicate and tricky to handle. Use pastry flour if you're a confident pie baker. All-purpose flour (11.7% protein) will make a moderately tender crust whose dough is easy to handle and roll out. Use all-purpose flour if you're less sure of your skills; you can move up to pastry flour when you're ready. Our Pastry Flour Blend, with its 10.3% protein, offers the tenderness of a pastry flour crust with the easy handling of all-purpose dough. Whole wheat flour makes a crust that's noticeably grainy, due to the flour's bran; it'll also be less tender than either all-purpose or pastry flour crusts. Whole wheat pastry flour is both lower protein and more finely ground, and will produce a more tender, delicate crust than standard whole wheat flour. Gluten-free crust requires gluten-free flour and a gluten-free crust recipe. We don't advise simply substituting GF flour in your favorite non-GF crust recipe. Why is fat so important in pie crust? Tenderness and flakiness are the hallmarks of a great crust. How do you attain both? It's all in how you combine fat with flour. By working part of the fat into the flour thoroughly, you coat the flour's gluten with fat; this yields a crust that's tender, rather than tough. Leave the rest of the fat in larger pieces, and it separates the wafer-thin layers of flour/water that make up the bulk of the pie dough. As the pie bakes and the fat melts, these layers stay separated; we perceive them as flakiness. We're big fans of our All-Butter Pie Crust. But an all-shortening crust has its proponents, as well. See our comparison of the two: Butter vs. shortening: the great pie crust bakeoff. Shortening. Butter. Lard. Oil. Each of the three solid fats will yield reliably tender, flaky crusts, so long as you combine them with the flour using the correct technique. An oil crust will be more tender than flaky. Vegetable shortening yields a crust that holds its shape well in the oven. For pie with the sharpest-looking crimp, use shortening. Its downside? Shortening lacks flavor, and an all-shortening crust may taste flat. Butter makes a flaky crust that's packed with wonderful flavor. Due to its water content, it also makes a "loftier" crust; as butter melts it gives off water that turns to steam, which in turn separates the layers a bit, yielding a slightly puffy crust. We prefer unsalted to salted butter, as it's generally fresher; it also lets us control the level of salt in the crust more precisely. Lard, rendered from pig fat, has a higher melting point than butter or shortening; thus it yields an extra-flaky crust (though the flakes are small in size, rather than large). It also gives pie old-fashioned diner-style flavor. Vegetable-based oil, including olive oil, makes crust that's somewhat hard to handle; without the "plasticity" of solid fat, it tends to crumble as you roll it. Also, an oil crust will be only marginally flaky — but very tender. Which fat should I choose? If you choose a solid fat, make sure it's cold! Chunks of cold fat in pie crust dough are your ticket to a flaky crust. We find that a combination of butter and shortening, like that in our Classic Double Pie Crust and Classic Single Pie Crust recipes, makes crust that's easy to handle: flaky, tender, and full-flavored. Salt is added to pie crust dough for one chief reason: flavor. While it does strengthen the flour's gluten just a touch, making the dough easier to roll out, its basic role is heightening the flavor of the flour and fat, and thus the crust overall. Does it matter if you use sea salt, kosher salt, or table salt? Only to your measuring spoon. The coarser the salt, the more space it takes up. All of the pie recipes on our King Arthur Flour site are written for plain table salt. If you use a coarser salt, you'll want to add more than the recipe calls for, to taste. You'll also want to dissolve coarse salt in some of the water from the recipe, to make sure it's fully dispersed throughout the dough. What about that vodka trick? You may have heard about substituting vodka for water to make an extra-tender crust. Since vodka is alcohol, the theory is it won't toughen your crust like water can. In our experience, vodka makes pie dough slightly easier to roll out, but doesn't result in any appreciable difference in the baked crust's flakiness or tenderness. Water mixed with flour gives pie crust dough the structure it needs to hold together. The amount of water you use is critical; too much, and you've made a sticky mess. Too little, and the crust won't hold together, or will crack around the edges as you roll. You'll notice that there's usually very little water in pie crust. Your goal is to use just enough to create a flour/water matrix that'll hold its shape, but not enough to potentially make the crust tough. 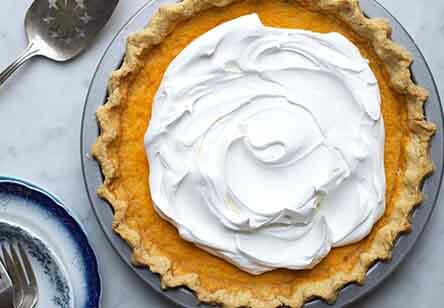 In addition, using ice water helps the fat remain cold and solid; and the colder the fat when you put the pie into the oven, the greater the chance for flakiness. Why is it important to keep the fat cold? Flour and water combine to form thin layers (flakes) in pie dough. The chilled fat in the unbaked dough keeps its thin layers of flour/water separated; so long as that fat is cold, the layers stay separate. When the pie finally goes into the oven the fat melts; but the space where the fat was remains, yielding layers of flakes: flakiness. You may have seen pie crust recipes calling for an egg, milk, buttermilk, vinegar, lemon juice, or sugar. All of these add-ins have their own minor effect on the dough. Egg, milk, and buttermilk add protein, which enhances browning and tenderness. Egg also makes a sturdier crust, one with more body; bakers will often use an egg in pies they want to serve outside the pan. We used to think that lemon juice or vinegar "tenderized" the gluten, encouraging it to remain un-elastic and making the dough easier to roll. As it turns out, the small amount of these acidic liquids added to pie crust dough doesn't really do anything one way or the other — though there's no harm in using either, if that's what you're used to. Sugar enhances both flavor and browning when added to pie crust dough. When sprinkled atop the oven-ready pie, it offers a bit of crunch, as well as pretty shine. How to make great pie crust. You've got the recipe. You've chosen your ingredients. Now let's put everything together and make a tender, flaky pie crust, a worthy vessel for your favorite filling. 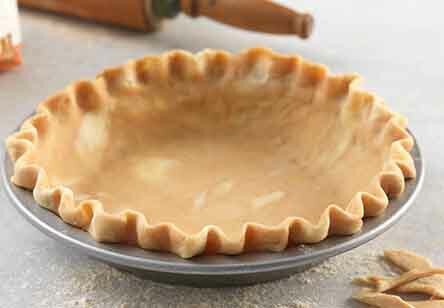 Below, see step-by-step directions for baking a basic pie crust using our Classic Double Pie Crust recipe. 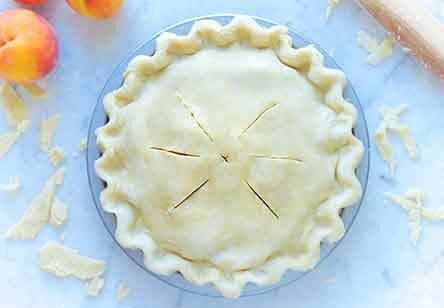 Start with our Classic Double Pie Crust recipe. Add the shortening to the flour, using a pastry blender, fork, mixer, or your fingers to work everything together until the mixture is evenly crumbly. Cut the butter into pats, and work it in. Leave some of the butter in larger, pea- or marble-sized pieces. This will create space between the layers of pastry, which translates to flakiness in the baked crust. Stir in 4 tablespoons of the ice water. Then add additional ice water, 1 tablespoon at a time, stirring until the dough starts to become cohesive and form clumps. Transfer the crumbly dough to a piece of parchment. Squeeze it into a ball. If it's dry and chunks break off, spritz the dry parts with additional ice water. Use the parchment to press the dough together until it's cohesive. Fold the dough over on itself three or four times to bring it together. This will create layers, which translate into flakiness. Divide the dough into two pieces; the bottom crust should be larger than the top. Flatten each piece into a disk, then roll like a wheel to smooth the edges. Refrigerate for at least 30 minutes before rolling. Because freezing expands and contracts the water in pie crust, which tends to break down its structure, the best type of crust to freeze is one with a higher percentage of fat and less water. While we've kept frozen crusts for up to 6 months, we prefer using them within 2 to 3 months. Freeze prepared pie dough in a round disc, well-wrapped. Or roll the dough out, fit it into a pie pan, crimp its edges and freeze, uncovered. As soon as it's solid, remove the crust from the pan, wrap in plastic, and return to the freezer. If you're making multiple frozen crusts, stack them (once frozen) with 9" parchment rounds in between for protection; wrap well in plastic, then store in a zip-top bag (for easiest handling). "Easy as pie" isn't always the case! Why does your pie dough crack as you roll it? What's the best way to move delicate pastry into its pan? And what about that soggy bottom crust...? If you're puzzled by pie crust, contact us: we're your best friend in the kitchen. And we're not just pie perfectionists. Our seasoned staff of bakers knows bread and pizza, cookies and cake, scones and biscuits and muffins. If you can't figure out why your cupcakes crumble or your sourdough isn't sour enough, we can help. We're available via phone, email, or live chat 7 days a week.